Against Newton2/Much Ado About Everything ! 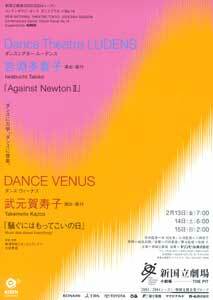 Iwabuchi Takiko "Against Newton II"
Takemoto Kazco "Much Ado About Everything ! " Sponsored by : Kirin Brewery Co., Ltd.
>> Much Ado About Everything ! The theatre opens 45minutes before the curtain rises. Available from Wednesday 17 December, 2003 at 10:00am. Iwabuchi Takiko creates dance by focusing on interesting and mysterious movements of the body, and she realistically depicts the inner world of human beings through studies in bodily dynamism. Takemoto Kazuko brings unanticipated interaction to the stage through cooperation with musicians. The forthcoming production will make possible a unique combination of up-and-coming choreographers with the ballet companies led by these two female dancers. Free ideas not bound by established concepts will easily transcend the boundaries of dance to create a new space of performance. These two works will be staged with new and original approaches, and a fresh feeling that could only come from a woman. These two works will form two "dance messages" from the New National Theatre, Tokyo to audiences for the Valentine's Day, 2004. Iwabuchi Takiko graduated from Tokyo Gakugei University and completed courses in exercise physiology and kinesiology at the University's Graduate School. She obtained a Professional Dance Studies Diploma from the Laban Center. After joining projects led by Herve Robbe, Ted Stoffer and other choreographers as a dancer, she returned to Japan in 1999 and founded her own company Dance Theatre LUDENS. Dance Theatre LUDENS was formed in 1999. Since then, the dance company has presented numerous collaborative works that focused on the process of creation. Works performed so far include Via; Be, Es and Distance, which were all commissioned by the organizers of the Park Tower Next Dance Festival; Against Newton presented at the NNTT's Dance Exhibition 03. In 2001, Ms. Iwabuchi won the Yokohama Culture Foundation Award and the French Embassy Award for Young Choreographer for her performance of the duo version of Be at the Yokohama Sole �~ Duo Competition. Dance Theatre LUDENS has been annually supported by the Saison Foundation for its activities since 2000. It has been invited to international festivals held in Japan as well as in South Korea, Tunisia, France, Austria, the United States and other countries. Other creative activities at home and abroad include performances at the Akiyoshidai International Art Village and resident activities by Ms. Iwabuchi at the National Choreographic Center in Tours, France. In the forthcoming production, based on Against Newton, which was first performed at the NNTT for its Dance Exhibition 03, audiences can expect to see further developments by the company. Much Ado About Everything ! After studying under Nakamura Yuko, Eguchi Takaya, Kanai Fumie and Kono Jun, Takemoto formed her own dance company Dance Venus in 1991. She has applied her body to many roles as leading dancer in works by other choreographers. In 1986, she spent one year in New York as one of the Agency for Cultural Affairs-sponsored overseas trainees, and in 1992, she announced her work Ahuu�c. Since then, her attempts at employing her body to express feelings that cannot be described by words have continued to the present day. In 1996, she began her solo activities overseas and at the same time has been active in collaborations with Japanese as well as Western artists and musicians. At the NNTT, she appeared in Maihimetachi no Gogo (The Afternoon of Dancing Girls) in March 2000 and Kukan no Shigaku (The Poetics of Space; choreographed by Chizuru Shoda) in December 2001. Her major works include Peace of Mind, Song of Memory: Garden, Stone Flower and Ahuu�c.